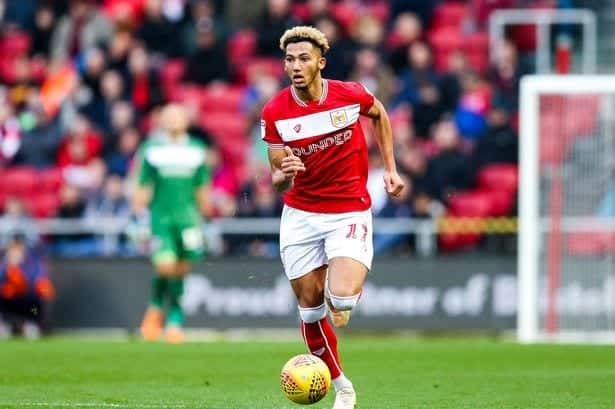 For Bristol City’s tremendously talented youngster, Lloyd Kelly, playing in front of his home crowd at Ashton Gate for England’s U21s vs. Poland served as the latest milestone in what’s been a memorable 18 months for him. Having made his first-team debut back in August 2017 vs. Plymouth Argyle in the EFL Cup, his progress has been hugely impressive, as he’s made the step up from academy football to the professional level rather smoothly. Now an integral component within Lee Johnson’s promotion chasing Robins squad, the versatile defender, who’s capable of playing left-back and centre-back, showed many glimpses of why he’s so highly regarded in the Poland match. Oozing class and quality, the elegant defender grew into the match nicely, as he contributed valuably on both sides of the ball from his left sided central defensive post. With England dominating possession and Poland happy to sit off and retreat into a deep block, Kelly was afforded plenty of time to show off his coherent passing ability. Key in constructing many of England’s most dangerous attacks, his pass selection was spot on. 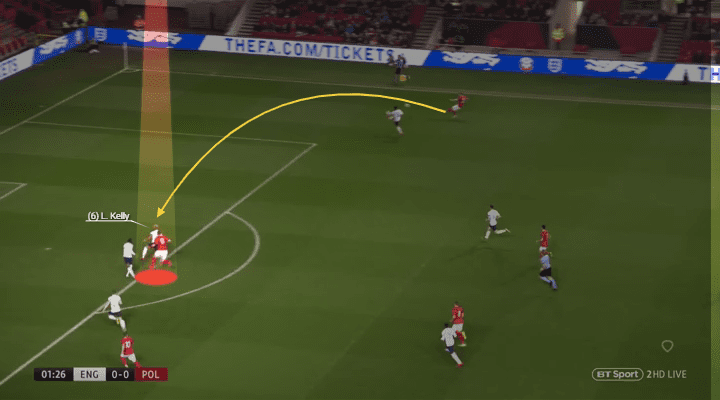 Choosing the right moment when to play vertical line breaking passes into the feet of his attackers, circulate possession or switch the angle of attacks, his distribution was on point. Executing his passes with accuracy and ideal weighting, Kelly gave his teammates every chance to control the ball cleanly and continue attacks due to his precision. Knowing how deep the Poles were positioned, the Bristol starlet would regularly drive upfield with the ball at his feet, in order to provoke a pressing action from an opposition midfielder, which subsequently created a free man, opened a passing lane or manipulated their adversaries’ setup. Dribbling with intent and confidence, his ball carrying was extremely useful in the Young Lions’ attempts to break down their stubborn foes. Moving onto his defensive exertions, and the 20-year-old undertook his duties with a nice blend of smarts and physicality. Working nicely alongside Fikayo Tomori, he positioned himself soundly, making sure to keep his spacing, shape and compactness in line with his backline. Reading the play neatly and concentrating sharply, he made good decisions when to shift laterally, step up, drop back or when to press any opponents in his designated area of operation. Responding swiftly to pressing triggers such as his man dropping deep with their back to goal, his quick reactions enabled him to get touchtight to his marker so they struggled to control cleanly and couldn’t turn him. 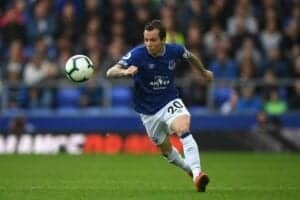 This aspect of his outing transferred into how effectively he managed crosses and cutbacks, meaning he took up top positions to quell any danger. Kelly’s eye-catching athleticism served him wonderfully too, for he tidily tracked runners in behind, rapidly jetted across to support a teammate and was able to sprint back and thwart counter attacking situations. One especially prominent example arose in the 30th minute, where the dynamic Kelly used his blistering speed to motor back roughly 50 metres to stop a transition dead in the water while recovering possession back for his side. Considering he’s mostly featured at full-back for Bristol City, and therefore hasn’t been frequently deployed in the heart of defence, his solid body of work was a testament to his quality and adaptability. By the numbers, his three won aerial duels, three interceptions, three tackles, nine ball recoveries, five progressive runs, one dribble, one key pass, plus the fact he completed 9/10 attempted final third pass, made 44 of his 49 overall attempted passes and won 9 of his 11 overall defensive challenges, demonstrated his all-round efforts. His manager at Bristol, Johnson, summed up what a bright future Kelly has in his past comments. “He’s certainly got all the tools. He’s 6ft3, he’s got lovely agility,” he explained to the Bristol Post. He then added his thoughts on his future at centre-back, stating: “Obviously at centre half he is still learning at Championship level but at left-back he has excelled. I think he will be a centre-half as he ages and progresses and gets that experience but at the moment he is doing a sterling job at left back. After yet another accomplished showing, it’s hardly surprising he’s attracting the interest of many of England’s top clubs, including Arsenal, Manchester United, Tottenham Hotspur and Liverpool. While Bristol will certainly have their hands full keeping their coveted homegrown prospect, they’ll be hoping his attachment to the club will see him stay for a little longer yet at least. Either way, both domestically and internationally, the future looks exceptionally bright for the immensely gifted Kelly.